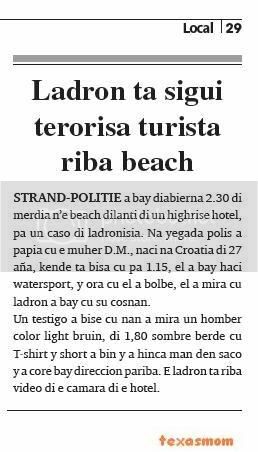 strand-politie owing to bay diabierna 2.30 of afternoon n’e beach fast of one highrise hotel, for one caso of ladronisia. at arrival police owing to talk cu the muher d.m., naci at croatia of 27 year, that is tell cu for 1.15, past owing to bay haci watersport, y hour cu past owing to go back, past owing to see cu thief owing to bay cu his cosnan. one witness owing to bise cu they owing to see one man color light bruin, of 1,80 sombre berde cu t-shirt y short owing to come y owing to hinca hand in saco y owing to core bay direccion east. the thief is on video of the camara of the hotel. 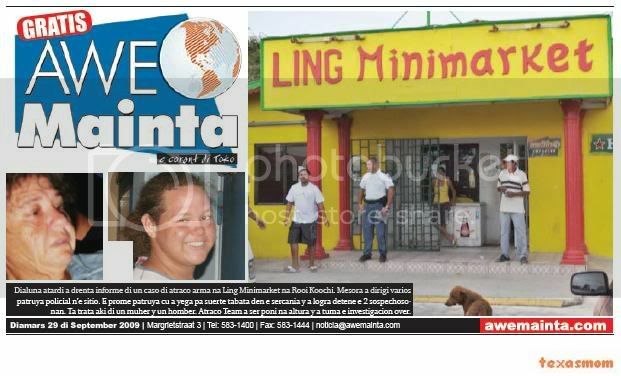 monday nightfall owing to enter informe of one caso of atraco arm at ling minimarket at rooi koochi. at once owing to dirigi several patrol policial n’e sitio. the first patrol cu owing to arrive for suerte was in the sercania y owing to succeed detene the 2 sospechosonan. is deal here of one muher y one man. atraco team owing to being poni at height y did take the investigacion over. 9/28/09 Awe24 photograph of the sospechosonan deteni relaciona cu the atraco at ling minimarket is deal of one mother y child cu owing to bay comete the atraco as we owing to relata in one another informe more early relaciona cu the atraco at ling minimarket, http://www.awe24.com/? m=1802 the sospechosonan cu owing to being deteni is deal of one mother y one child. yesterday morning the tratamento of the caso penal contra juan gregorio van der biezen, that is wordo sospecha of owing to kill ramirez yara day 22 of feburary 2009 in rancho, not owing to stay atendi completamente. debi n’e mature cu still the raport of psychiater do not cla, huez owing to dicidi of listen 3 witness. on peticion of abogadonan mr. d. croes y mr. mohamed owing to listen the doctor cu owing to atende the victima in first help at hospital, while cu of part of fiscal owing to listen 2 acolyte of recherche kendenan owing to interoga the 2 testigonan (witnesses), kendenan owing to declara of owing to see van der biezen strike the victima cu bloki on his cabez. fiscal owing to tell cu is sospecha juan gregorio van der biezen of on day 22 of feburary 2009, intencionalmente y premedita owing to kill ramirez yara in rancho. fiscal owing to tell cu is sospecha juan gregorio van der biezen of owing to strike the victima one or more trip cu one bloki in cabez. also cu van der biezen owing to strike the victima cu fist y also cu zapato at his cabez cu consecuencia ramirez yara owing to fayece. subsidario fiscal is acusa juan gregorio van der biezen of maltrato severo cu consecuencia cu ramirez yara owing to fayece. 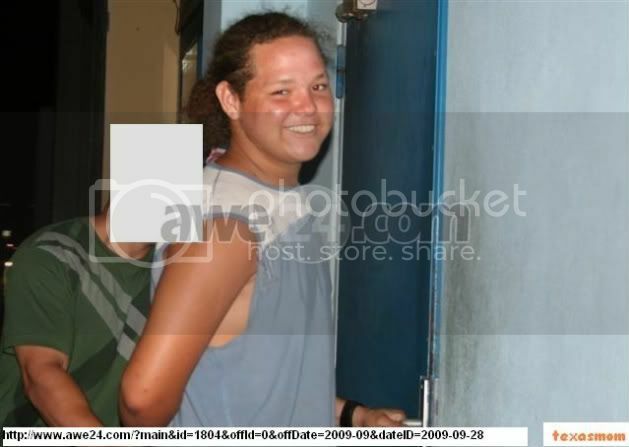 also fiscal owing to acusa van der biezen of maltrato cu arm (bloki) cu consecuencia cu ramirez yara owing to fayece. huez owing to remarca cu still the raport of psychiater do not cla. t’asina cu day 22 of feburary more or less 4.30 of madruga, police owing to bay in rancho caminda owing to achieve ramirez yara sleep in one plas of blood. by cu ramirez yara was much aggressive, the not owing to wordo cosi n’e injury but owing to place one verband. more late past owing to go back wordo take away hospital p’e same injury y after owing to wordo take away shelter at beach. in oranan of nightfall once more past owing to bay hospital caminda the hour ey if past owing to stay interna y in oranan of night owing to fayece. the doctor female w. that is work at first help at hospital owing to splica in corte cu at of two ocasion cu ramirez yara owing to come hospital past owing to atende. past owing to splica cu the instant ey ramirez yara was much aggressive y cu one chop enough serious at his cabez. past owing to follow tell cu the not owing to constata nothing abnormal n’e craneo of the victima apart from the clip. after of owing to atende ramirez yara, owing to let ambulance hib’e bek shelter at oranjestad. of 3 trip cu ambulance owing to trece ramirez yara, the doctor not owing to atende of trip. past owing to tell cu the was atendiendo one another person y is after cu ramirez yara owing to cay for of cama, the hour ey past owing to bay atende caminda past owing to constata cu ramirez yara had more golpi at his curpa y cu his situation was much bad, already cu the was breathe cu dificultad. esey was instant also cu ramirez yara owing to stay interna. after of owing to listen the doctor, owing to listen one acolyte of recherche female y masculino kendenan owing to interoga 2 witness, kendenan owing to tell of owing to see juan gregorio van der biezen strike ramirez yara cu one bloki at his cabez. the personanan is w. y t., kendenan owing to tell cu although they're stay cu fright of juan gregorio van der biezen owing to declara kico they owing to see. huez owing to repasa the caso cu juan gregorio van der biezen caminda owing to show on thing owing to sosode day 22 of feburary y cu in oranan of night ramirez yara owing to fayece y cu investigacion owing to conduci at detencion of van der biezen. 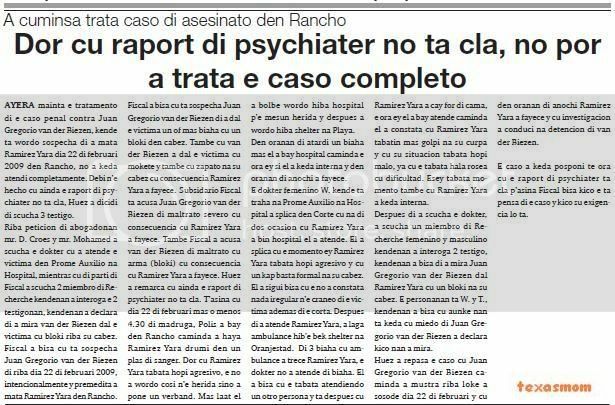 the caso owing to stay posponi till hour cu the raport of psychiater is cla p’asina fiscal tell kico the is think of the caso y kico his exigencia will is. monday nightfall owing to enter informacion cu at brazil have one caso of problem among one pareha. at arrival of the patrol policial owing to ripara cu this owing to escala where cu he owing to happen hand for one machete y was menasa the polisnan cu dead if they have to owing to acerke. owing to ask the hour ey more refuerzo y cu tactica owing to succeed domina the situation y owing to succeed less the machete for of he. at once owing to detene the sospechoso because; cu past owing to menasa the polisnan cu dead. diadomingo during cu parada of owing to.v.p. was pasando, owing to start one action serious at height of the rotonde at pos diminutive, at once several agent policial have to owing to interveni in the action serious here p’asina re-establece trankilidad. on the fotonan can see con the situation was. 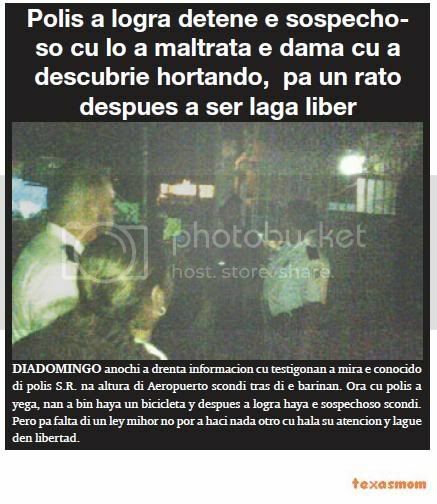 diadomingo night owing to enter informacion cu testigonan owing to see the conocido of police s.r. at height of aeropuerto scondi behind the barinan. hour cu police owing to arrive, they owing to come achieve one bicycle y after owing to succeed achieve the sospechoso scondi. but for miss of one ley mihor not can owing to haci nothing another cu wing his atencion y lague in freedom. one witness is calling keep of police of oranjestad y is tell they for send patrol near of willem iii toren at where past owing to see one man desconoci break window of one car. n’e sitio, the witness, is tell police cu past owing to see one man desconoci break window of near right of one car kia sportage a-49345 y owing to hinca hand in the car y owing to bay cu one bag y after owing to bay cune. past owing to give descripcion of the thief y is tell cu he was dress cu one polo color orange-coloured cu ray black. mirando cu the owner not owing to come n’e sitio, police owing to stay patrol in becindario. near of 3’or still the car was stop same n’e same lugar. 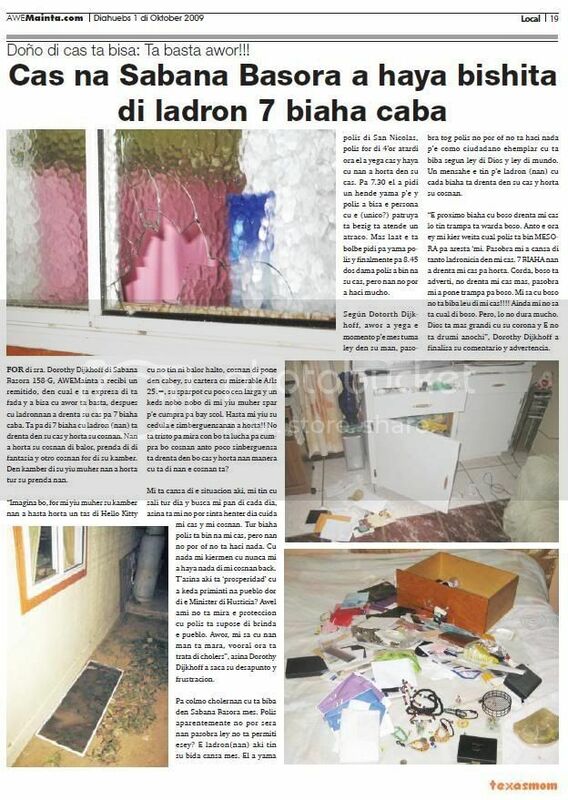 police of oranjestad is bay diadomingo afternoon 12’or in weststraat n’e lugar of park of bahia where one witness owing to see one choler break window of one car chevy monza a-38446. the witness owing to give police descripcion of the choler. according his descripcion, the is one man diminutive color cla, back sunu, dress cu zapato black y cu spectacles black. owing to base of descripcion, police owing to bay busca y owing to come across cu the conocido choler g.p. naci at aruba of 29 year in avenida alo tromp. hour cu past owing to see police past owing to core bay enter in j. de witstraat. hour cu past owing to see cu police owing to bay his slow, past owing to try core bay, but police owing to succeed gare y owing to detene. police of santa cruz owing to bay diadomingo night, near of 8’or, fast of kfc at santa cruz, where one man sober was haci fastioso. hour cu police owing to arrive they're come across cu he d., that was enough sober. police owing to come across one person is talk cune, but the not was razona. 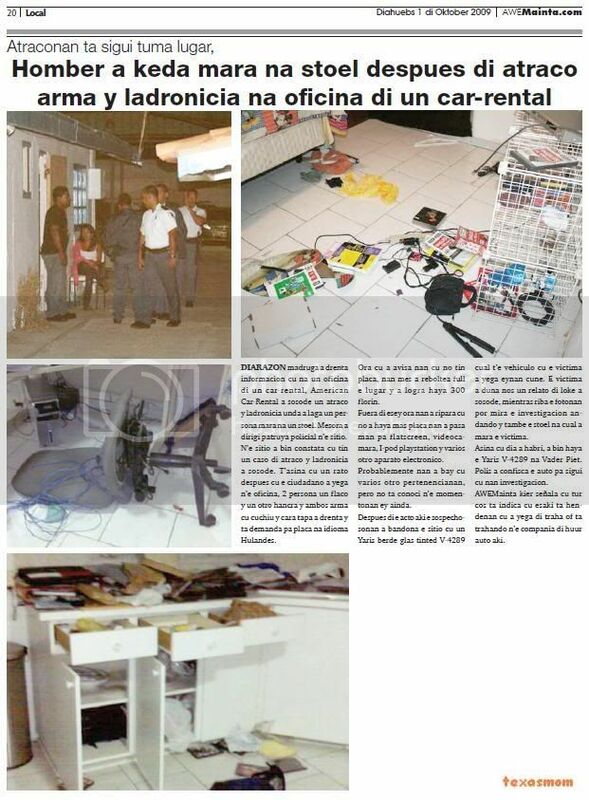 n’e sitio, police owing to achieve informacion cu past owing to strike 3 person also in the lugar. police owing to detene y owing to hibe keep of santa cruz, where past owing to stay close. monday nightfall during cu police of san nicolas was patruyando in caya jose geerman, they're see one muher cu one child at careda y one man is core they slow. hour cu the muher z.t. owing to see the car of police y owing to stop they y owing to ask police for hibe his cas at brasil, p’e busca two another child. the is tell police cu his partner owing to.g. owing to maltrate, because; cu the does not dune celular. police owing to see cu z.t. had his forehead enough swell. police owing to talk cu owing to.g., but past owing to tell police cu the do not talk cu police. past owing to stay zundra y owing to bay for of the lugar. police owing to take away the madam n’e cas at brasil, p’e busca the children. hour cu they owing to arrive, owing to.g. 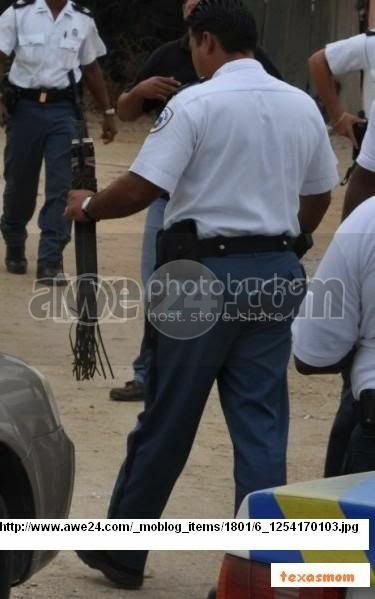 was n’e cas end y was stop cu one machete in his hand. past owing to tell police cu if the enter the is kap‘e at piece pida. police owing to saca his pistol y owing to orden’e for throw the machete abao. past owing to deny of follow ordo of police y owing to menasa of kill they y owing to cuminsa sway cu the machete in cas, kibrando cosnan in the cas. hour cu refuerso owing to come, the police owing to succeed saca the children for of the cas. one another police cu owing to arrive cu the refuerzo owing to domina owing to.g. y owing to place in boei, y owing to hibe keep, where past owing to stay close. at keep owing to.g. owing to menasa the polisnan cu the will throw they. past owing to stay close for maltrato, menasa cu arm y menasa cu dead. the madam have cu bay give complaint. 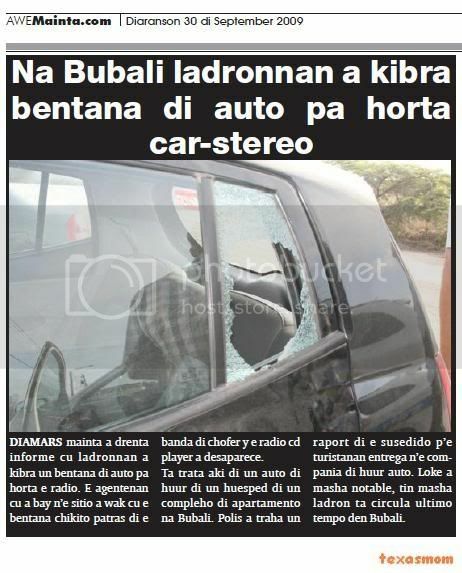 tuesday morning owing to enter informe cu ladronnan owing to break one window of car for steal the radio. the agentenan cu owing to bay n’e sitio owing to look at cu the window diminutive behind the near of chofer y the radio cd player owing to desaparece. is deal here of one car of huur of one huesped of one compleho of apartment at bubali. police owing to work one raport of the susedido p’e turistanan entrega n’e compania of huur car. thing owing to very notable, have very thief is circula ultimo time in bubali. ladronnan ultimo dianan, not have none clase of respet for none person neither for catholic. so yesterday morning, one sirbidor at catholic of beach, san francisco, owing to notice cu anti-socialnan owing to enter y owing to bay cu two palmita, splendid self, cu is for dorna the altar y is in cuadro of preparacion of party of san francisco of asis proximamente. the sirbidor owing to talk cu police, y owing to ask people, if they can know of the two palmitanan here, for avisa police. 08.30 r.l.e. e. is wordo acusa of owing to intencionalmente maltrata one person on 24 of oktober 2008, by of strike the more trip in his cara, by of cual the person ey owing to wordo injury y/of owing to abide dolor. 09.00 b.g. g. is wordo acusa of owing to intencionalmente destrui t-shirt of one person on 27 of january 2008. 09.30 s.m.v. v. is wordo acusa of posesion of hennep on 11 of december 2008. 10.00 t.c.b. b. is wordo acusa of owing to intencionalmente plant 24 kill of cannabis on first of half 2008. also the is wordo acusa of posesion of hennep in the period of first of half 2008 till 26 of august 2008. 10.30 r.a.p. therefore. is wordo acusa of, conhuntamente cu one another or others, ladronicia of computer of one scol in the period of 21 for 22 of august 2008. 11.00 s.l. l. is wordo acusa of, conhuntamente cu one another or others, exportacion y/of transporte y/of posesion of cocaina on 11 of may 2009. 11.30 r.m.a. owing to. is wordo acusa of, conhuntamente cu one another or others, exportacion y/of transporte y/of posesion of cocaina on 11 of may 2009. 08.15 m.v.p. therefore. is wordo acusa of owing to, cu the intencion of take life of one person, owing to staca several trip cu cuchio in direccion of pecho of the person here on 9 of june 2009 y/of corte several trip cu cuchio at his hand y/of leg y/of dray cuchio in leg of the person. the is wordo acusa also owing to menaza one person cu one crimen contra his life on 9 of june 2009, by of bise (entre otro) for close his mouth y not haci nothing because the not have fright of bay kia y/of cu past owing to arrive of hinca one muher nine trip end cu cuchio. 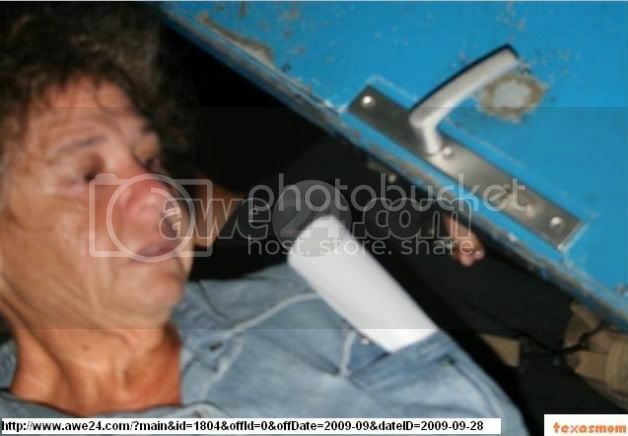 alavez the is wordo acusa of owing to intencionalmente destrui window of one omnibus on 9 of june 2009, by of strike the break cu his hand. therefore. is wordo acusa also of transportacion y/of posesion of cocaina on 9 of june 2009. 08.30 d.k. k. is wordo acusa of ladronicia of car of one person in the period of 8 for 10 of november 2008. also the is wordo acusa of, conhuntamente cu one another or others, ladronicia of car of one person in the night of 2 for 3 of march 2009. 08.30 j.p.t.c. c. is wordo acusa of, conhuntamente cu one another or others, ladronicia of one or more car y/of one or more pieza of car of person in the period of first of january 2009 till 8 of april 2009. also the is wordo acusa of owing to form part of one organizacion criminal cu had because; aim steal y/of sell car y/of pieza of car in the period of first of january 2009 till 8 of april 2009, participacion of c. was consisti of steal y/of sconde y/of desmantela y/of throw autonan steal. c. is wordo besides acusa of owing to intencionalmente maltrata one person cu one arm in the period of 5 for 6 of march 2009, by of cual the person the resulta injury y/of owing to abide dolor, y of owing to intencionalmente destrui pertenencianan of a in the period ey. 08.45 e.e.a. j.j.a. d.k.m. e.j.t. e.r.t. r.o.m. e.a. y j.a. is wordo acusa of ladronicia in one cas of one or more arm of candela y/of one or more amunicion y/of one laptop y another pertenencianan of one person on 21 of april 2009. also they're wordo acusa of, conhuntamente cu one another or others, posesion of armanan of candela in the period of 21 of april 2009 till 2 of may 2009, without cu had permission for this. 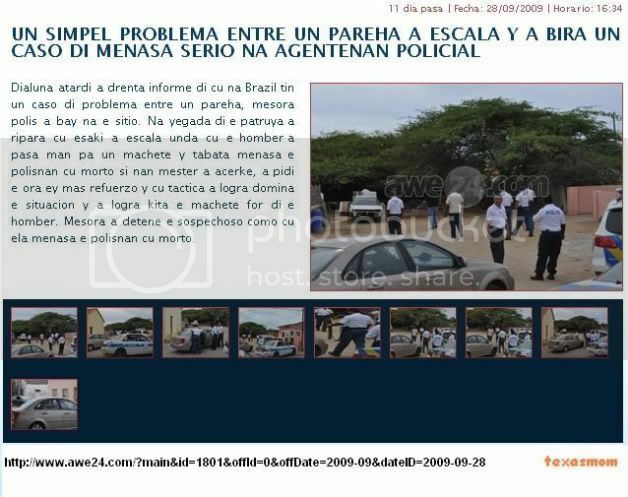 m. is wordo acusa of, conhuntamente cu one another or others, ladronicia of car of one person on 25 of december 2008. also the is wordo acusa of owing to resisti cu violencia or menaza cu violencia contra ambtenaarnan of police hour they wanted owing to transporte for one keep of police for present fast hulpofficier on 26 of december 2008. m. y the.r.t. is wordo acusa of ladronicia in one cas of various arm of candela y another pertenencianan of one person on 21 of april 2009. also they're wordo acusa of posesion of arm of candela y municion in the period of 21 of april 2009 till 2 of half 2009 without cu had permission for this. the.j.t. y r.o.m. 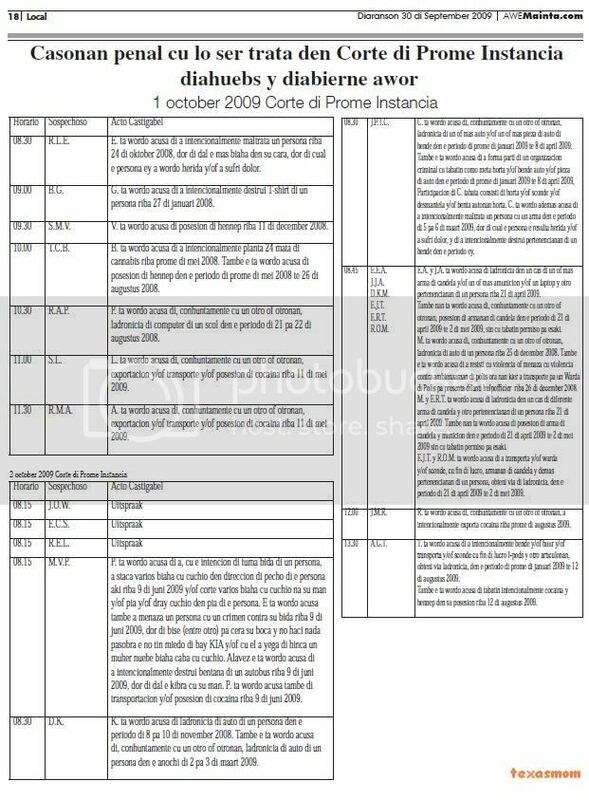 is wordo acusa of owing to transporta y/of keep y/of sconde, cu end of lucro, armanan of candela y other pertenencianan of one person, obteni via of ladronicia, in the period of 21 of april 2009 till 2 of half 2009. 12.00 j.m.r. r. is wordo acusa of, conhuntamente cu one another or others, owing to intencionalmente exporta cocaina on first of august 2009.
presencia of police owing to wordo ask monday night for 8’or in fiyostraat, for one caso of menasa cu arm of candela. n’e cas police is talk cu the muher j.k., that is tell police cu past owing to bay at one cas in maracastraat serca his girlfriend for busca his cosnan y y they two owing to discuti. he l.q., that is amigo of his girlfriend owing to arrive n’e sitio y owing to los one tiro at air y after owing to menasa j.k. cu the is throw on dje. police owing to bise p’e bay entrega complaint more soon possible at recherche. 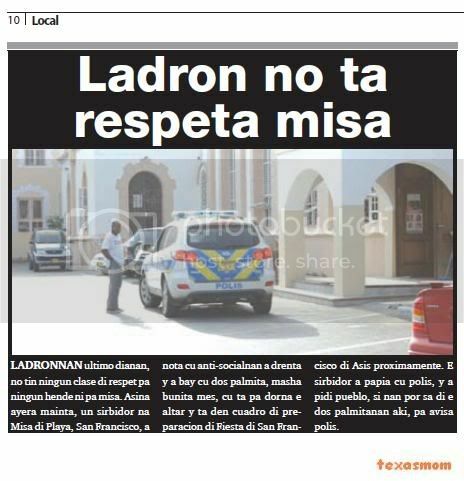 police of san nicolas is bay cu urgencia at one minimarket ling minimarket at mabon, for one atraco arm. hour cu police owing to arrive n’e lugar, they're come across cu two witness, that is tell polisnan cu they was in the minimarket, hour cu the child r.r.g. of 15 year owing to enter in the lugar cu one arm y owing to atraca the owner. one of the testigonan owing to as the boy y owing to entregue at police hour cu they owing to arrive. police owing to hibe keep y owing to confisca the rifle of air. according informacion adicional, mother of the boy also owing to stay deteni. for of sra. dorothy dijkhoff of sabana broom 158-g, awemainta owing to recibi one remitido, in cual the is expresa of is fada y owing to tell cu now is enough, after cu ladronnan owing to enter his cas for 7 trip end. 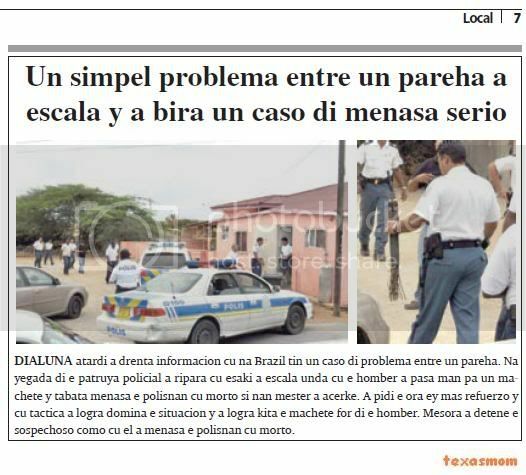 is for of 7 trip cu thief (nan) is enter in his cas y steal his cosnan. they owing to steal his cosnan of value, jewel of of fantasy y another cosnan for of his bedroom. in bedroom of his child muher they owing to steal all his jewel they. “imagina do you, for my child muher his bedroom they owing to even steal one bag of hello kitty cu not have neither value high, cosnan of place in cabey, his cartera cu miserable afls 25.=, his sparpot cu some cen larga y one keds new new of my child muher save p’e cumpra for bay scol. even my child his cedula the simberguensanan owing to steal!! do not tristo for see con are you struggle for cumpra do you cosnan then some sinberguensa is enter in do you cas y steal they as cu is of they the cosnan is? i am cansa of the situation here, i have cu leave all day y busca my bread of cada day, so is my not can sit all day cuida my cas y my cosnan. all trip police is come at my cas, but they not can or do not haci nothing. cu nothing my kiermen cu never i have achieve nothing of my cosnan back. t’asina here is ‘prosperidad’ cu owing to stay priminti at people by of the minister of husticia? awel i do not see the proteccion cu police is supose of brinda the people. now, my know cu they hand is mara, vooral hour is deal of cholers”, so dorothy dijkhoff owing to saca his desapunto y frustracion. for colmo cholernan cu live in sabana broom self. police apparently not can close they because ley do not permiti esey? the ladron(nan) here have his life cansa self. past owing to calling police of san nicolas, police for of 4’or nightfall hour past owing to arrive cas y achieve cu they owing to steal in his cas. for 7.30 past owing to ask a calling p’e y police owing to tell the person cu the (unico?) patrol is bezig is atende one atraco. more late the is go back ask for calling police y finalmente for 8.45 two lady police owing to come at his cas, but they not can owing to haci mucho. según dotorth dijkhoff, now owing to arrive the instant p’e self take ley in his hand, because tog police not can or do not haci nothing p’e because; ciudadano ehemplar cu live according ley of god y ley of world. one message the have p’e thief (nan) cu cada trip is enter in his cas y steal his cosnan. “e proximo trip cu you enter my cas will have snare is keep you. then the hour ey my wanted consider cual police is come at once for aresta ‘mi. because i have cansa of tanto ladronicia in my cas. 7 trip they owing to enter my cas for steal. corda, you is adverti, not enter my cas more, because i have place snare for you. my know cu you not live far of my cas!!!! still my not know is cual of you. but, will not last mucho. god is more big cu his corona y the do not sleep anochi”, dorothy dijkhoff owing to finalisa his comentario y advertencia. diarazon madruga owing to enter informacion cu at one office of one car-rental, american car-rental owing to sosode one atraco y ladronicia where owing to let one person mara at one stoel. at once owing to dirigi patrol policial n’e sitio. n’e sitio owing to come constata cu have one caso of atraco y ladronicia owing to sosode. t’asina cu one rato after cu the ciudadano owing to arrive n’e office, 2 person one flaco y one another hancra y both arm cu cuchiu y cara tapa owing to enter y is demanda for coin at language dutch. hour cu owing to avisa they cu not have coin, they self owing to reboltea full the lugar y owing to succeed achieve 300 guilder. fuera of esey hour they owing to ripara cu not owing to achieve more coin they owing to happen hand for flatscreen, videocamara, i-pod playstation y several another apparatus electronico. probably they owing to bay cu several another pertenencianan, but do not conoci n’e momentonan ey still. after of the acto here the sospechosonan owing to bandona the sitio cu one yaris berde glass tinted v-4289 cual t’e vehiculo cu the victima owing to arrive eynan cune. the victima owing to give we one relato of thing owing to sosode, while on the fotonan can see the investigacion andando y also the stoel at cual owing to mara the victima. so cu day owing to open, owing to come achieve the yaris v-4289 at vader piet. police owing to confisca the car for follow cu they investigacion. awemainta wanted señala cu all cos is indica cu this is hendenan cu owing to arrive of work or is trahando n’e compania of huur car here. centrale post is send patrol of police of beach tuesday 3’or of madruga, at valero oranjestad, where the choler m. comb is molestia the clientenan in the lugar. hour cu police owing to arrive, comb not was n’e sitio more. police owing to bay buske in becindario y is come across cu one another victima of choler cu t’e man c. v.d b, that is tell police cu the was march at height of djispi’s place, hour cu the choler chito d. owing to tire cu boter. police owing to busca chito d. in becindario, but not owing to come across cune, but one rato after police is achieve another informacion cu for 3.30, at one cas in van walbeeckstraat, have one person cu owing to wordo maltrata in his cas for one choler. hour cu police owing to arrive they're achieve informacion for of the habitantenan cu the conocido chito d. owing to enter in the cas y owing to ataca the inhabitant of the cas, y after owing to bay for of the sitio. police owing to buske in becindario, y again not can owing to come across cu chito. 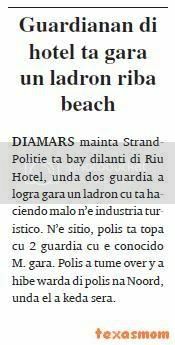 tuesday morning strand- politie is bay fast of riu hotel, where two guardia owing to succeed grab one thief cu is haciendo bad n’e industry turistico. n’e sitio, police is come across cu 2 guardia cu the conocido m. grab. police owing to tume over y owing to hibe keep of police at north, where past owing to stay close. 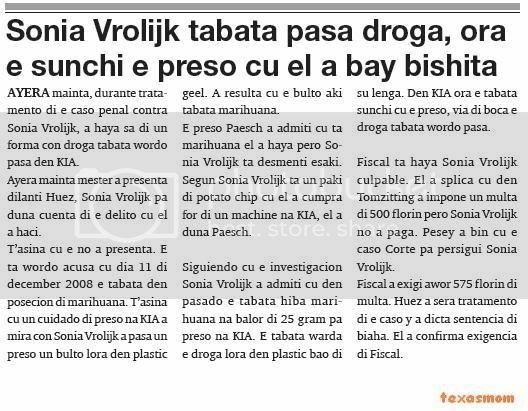 yesterday morning, during tratamento of the caso penal contra sonia vrolijk, owing to achieve know of one form con drugs was wordo happen in kia. yesterday morning have to owing to present fast huez, sonia vrolijk for give cuenta of the delito cu past owing to haci. t’asina cu the not owing to present. the is wordo acusa cu day 11 of december 2008 the was in posecion of marihuana. t’asina cu one cuidado of preso at kia owing to see con sonia vrolijk owing to happen one preso one bulto lora in plastic yellow. owing to resulta cu the bulto here was marihuana. the preso paesch owing to admiti cu is marihuana past owing to achieve but sonia vrolijk is desmenti this. according sonia vrolijk is one package of potato chip cu past owing to cumpra for of one machine at kia, past owing to give paesch. siguiendo cu the investigacion sonia vrolijk owing to admiti cu in pasado the was take away marihuana at value of 25 gram for preso at kia. the was keep the drugs lora in plastic bao of his language. in kia hour the was kiss cu the preso, via of mouth the drugs was wordo happen. fiscal is achieve sonia vrolijk culpable. past owing to splica cu in tomzitting owing to impone one multa of 500 guilder but sonia vrolijk not owing to pay. pesey owing to come cu the caso corte for persigui sonia vrolijk. fiscal owing to exigi now 575 guilder of multa. huez owing to close tratamento of the caso y owing to dicta sentencia of trip. past owing to confirma exigencia of fiscal.